A few days ago, Evan Michelson (third down) and I took the train to Modena (home of Ferrari, Lamborghini, and Balsamic Vinegar) to meet Alessandro Molinengo (top image), a long time internet friend and co-proprietor of the amazing Nautilus Antiques which we had both dreamt of visiting for some years. After our visit to the shop, Alessandro--who is, it turns out, also an excellent tour guide--suggested we make a trip to check out an obscure church in the tiny town of Grazie, Italy which his business partner Fausto Gazzi had suggested might interest us. None of us had been there before, so we hopped in the car and went. 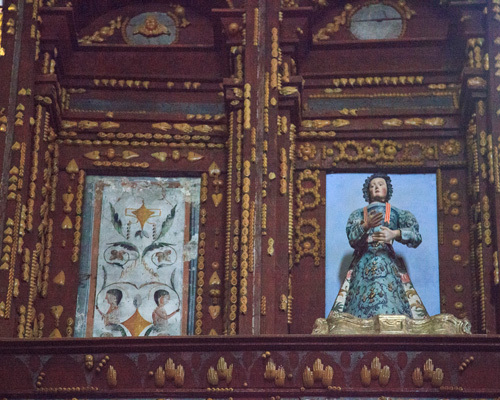 This church--the Santuario delle Grazie (or Shrine of Our Lady of Grace)--was a real surprise and an utter, stunning delight, a museum of sorts enshrining arcane forms of worship, collecting, and ex voto usage. What interested Evan the most was the crocodile hanging high in the nave, a hold over from a time when churches would routinely display natural curiosities (see top two images). 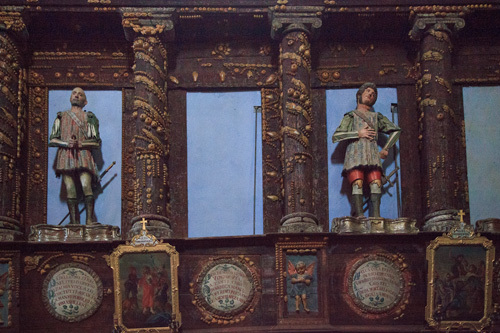 What interested me the most were the colorful and crudely fashioned statues which filled every available niche. 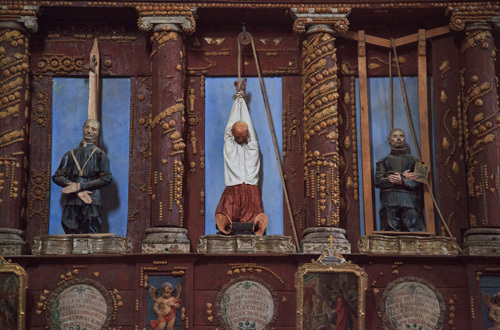 Half of these depicted what appeared to be important church visitors of centuries past, while the other half felt more like a dime museum's house of horrors, peopled with a variety of stiffly posed martyrs meeting imaginatively gruesome ends. Equally fascinating were the thousands of wax anatomical (hands, eyes, breasts, and Bubonic Plague buboes!) 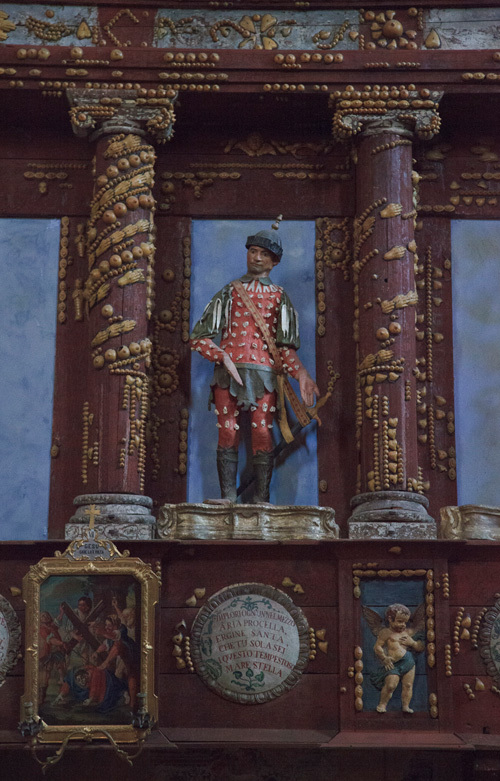 ex votos snaking decoratively over every available surface (as seen in all images, but especially 4th down). 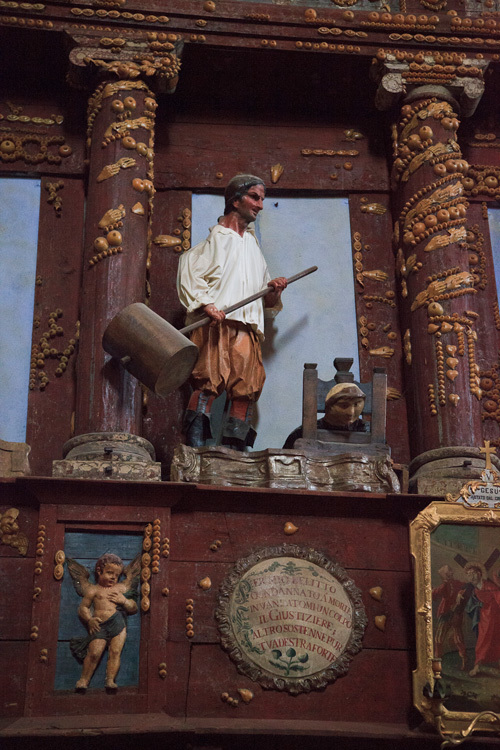 This pilgrimage church, with its tinny piped-in liturgical music and wax torture museum ambiance, felt somewhere between a circus sideshow and religious Disneyland, less fine art than folk art full of ancient sacred expression in a language we could only barely understand. 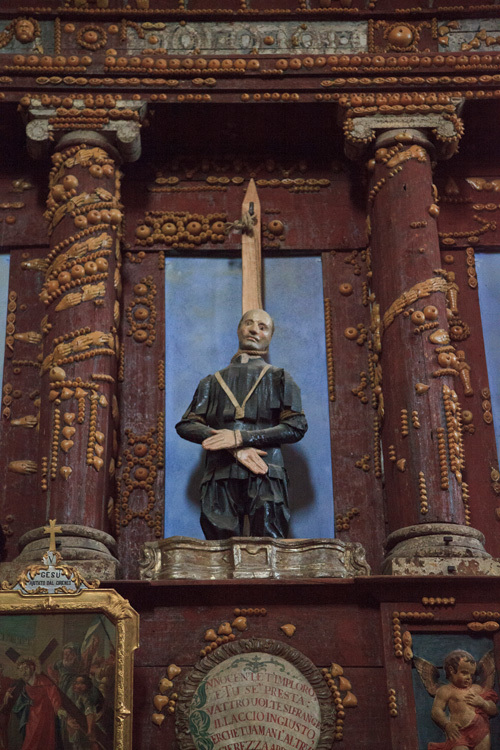 Evan and I had so many questions about this baffling and fascinating place that we asked Alessandro to write a guest post about the church and its history. Following is his post; you can find out more about Allesandro's truly amazing shop (more on that soon!) here (the website) and here (his Facebook page). Stay tuned for a full post on this almost painfully (as I have not much money) wonderful shop, what I would call the Obscura Antiques of Italy. The Shrine of Our Lady of Grace is a church in Lombard Gothic style, dedicated to the Blessed Virgin Mary, and is located in the small village of Grazie, close to the town of Curtatone, 9 km from Mantua. The origins of the church back to 1200, where, on a small promontory rising from the maze of flora and reeds, stood a small altar with the image of the Madonna and Child in which the fishermen of the lake and farmers were especially devoted. The devotion of the people of the area was old and well established; in that time the lake environment was indeed a source of livelihood but also hard work, starvation and disease, superstitions and fears, and this strength of faith was very comforting. 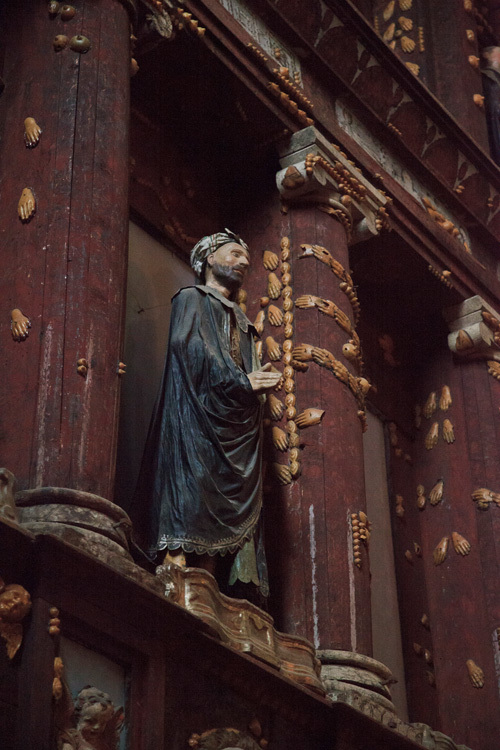 Towards the end of the fourteenth century, by the grace received, Francesco Gonzaga built a temple to the Virgin Mary, after the end to an epidemic of The Plague. 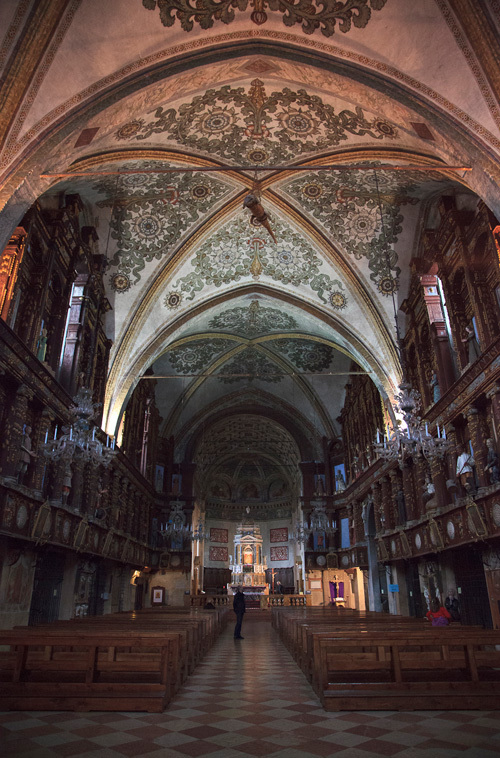 The construction cost 30,000 gold crowns and in August of 1406 the chapel was consecrated. 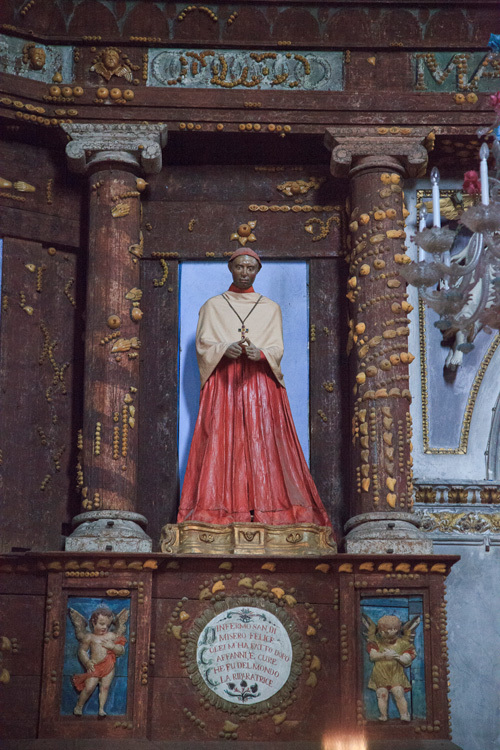 Soon after the completion of the basilica, pilgrimages to the church gradually assumed popularity, intensifying with the poor people of the surrounding countries, nobles, and even the Emperor Charles V and Pope Pius II who all came to visit the sacred image of Madonna and Child. So began a series of donations that brought even the original architectural features of the amendment, some important families valances they built chapels for prayer attached to the convent or in the church to bury their ancestors. From 1412 until the end of the century a convent, school, chapel, and library were added. In 1782 the monastery was closed and converted into a hospital. Thus began the decline of the Basilica. The Napoleonic invasion deprived the collection of votive offerings and many of its treasures, and the material contained in its rich library was dispersed or destroyed, and in 1812 much of the architectural complex was finally dismantled. 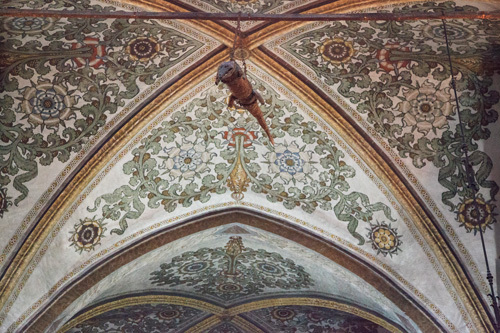 The interior is Gothic single nave, and the ceiling is a vault decorated with frescoes of flowers. 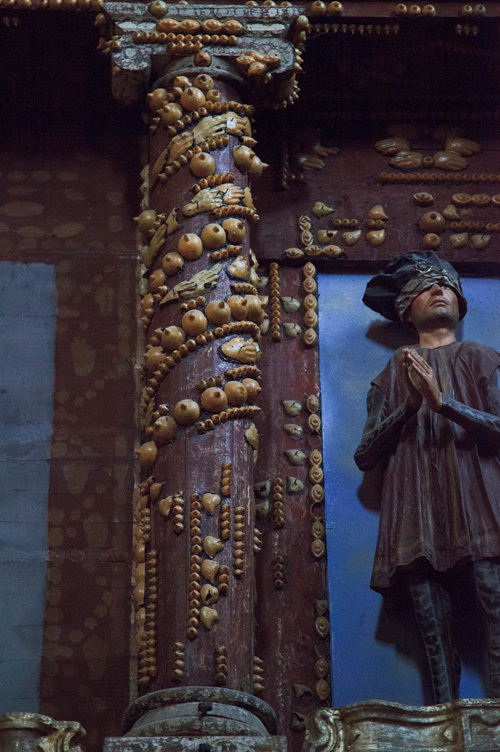 Upon entering, one is struck by the richness of the walls and its hangings because of a stuffed crocodile that was once located in the Shrine in the fifteenth or sixteenth century now hanging from the ceiling (top 2 images). 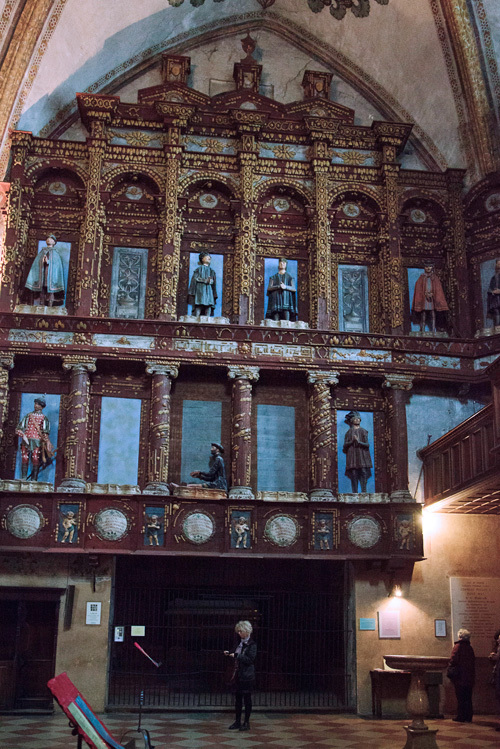 The middle part of the walls of the nave is lined with full-length wooden structure, with eighty niches arranged in two parallel rows, where many mannequins in various poses and situations representing episodes of danger averted by divine intercession are placed. Today only about forty statues remain. 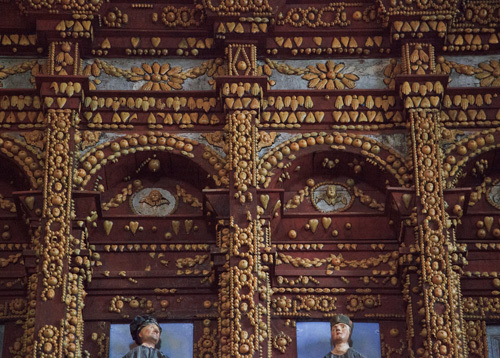 There is no wall, column, corner unadorned; decorations consist of rows of wax anatomical ex votos covering the walls not occupied by statues, drawing snake motifs around columns or below the arches of the niches. You see here ex-votos representing hearts, hands, eyes, breasts, and pestilential buboes (from The Bubonic Plague), which combine to offer the viewer a unique puzzle. 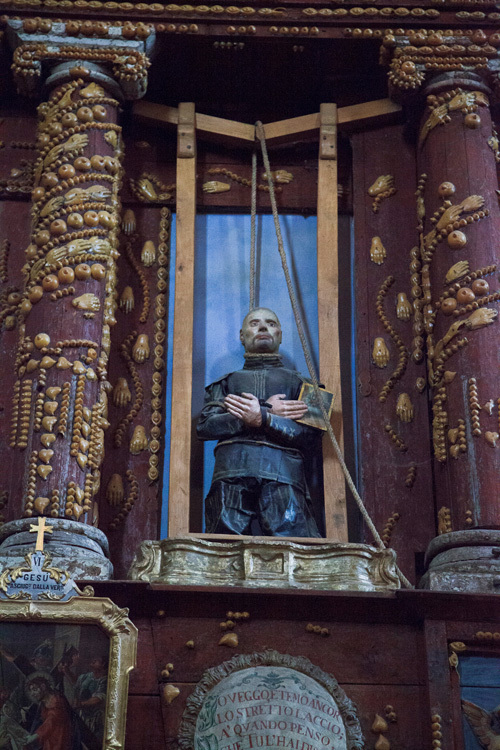 The life-size mannequins you see all around you, as well as their clothing, armor, helmets and weapons were constructed of papier-mâché, and most of them are attributed to Friar Francis Acquanegra, who created in the early 16th century. 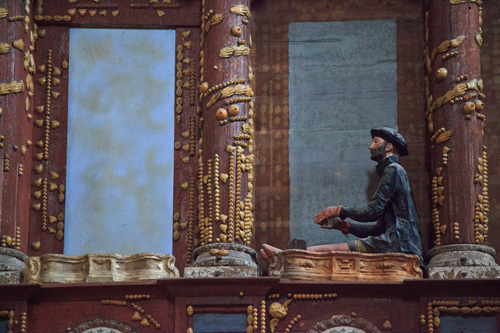 The statues were constructed of layers of paper and cloth hardened with plaster and painted with colorings and with honey added as a binder; subsequently, several elements were added that were created by casts; also, in some cases, wood was used for face, hands and feet (depending on the pose taken by the manikin), horsehair for hair and acorns for some particulars. As for the clothes, it was discovered that these were created from cotton fabric with hooks applied to statues and date back to the late nineteenth century. Twelve suits of armor have been reassembled from various statues. It is in fact defensive Gothic-Italian armor made in 1400 that covered completely the rider as they are made from different pieces of steel composed harmoniously ensuring effective protection. Examples of armor like this are extremely rare, if they can find in fact only eleven pieces all over the world, which is why today they are no longer exposed to the monastery but were transferred to the Diocesan Museum Francesco Gonzaga in Mantua. Various hypotheses have been made about the arrival of such prestigious reinforcements in the monastery; they were probably a gift of the Gonzaga family, lords of Mantua, unlike other more modest pieces (but still going back to 1500 ) from other sources. Under the niches are the metopes explaining in vulgar Italian the grace received as depicted in the dioramic tableau above. Sometimes the mannequins do not coincide with the metope below, a sign that over the years have been the first few shifts. A real star of the sanctuary is a crocodile (Crocodilus niloticus) embalmed and hung from the ceiling in the center of the nave. 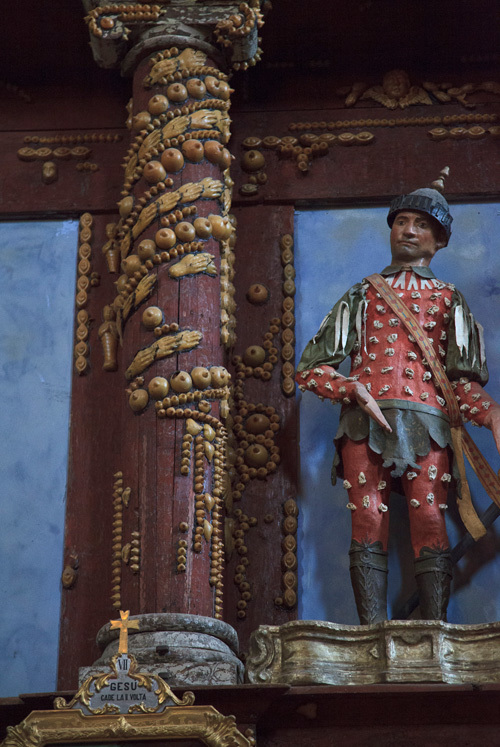 It is a real crocodile, not a model, in its entirety, which was added to the church in the fifteenth or sixteenth century and has recently been the subject of restoration. This is not the only Italian church where you can find such a strange thing; the church of Santa Maria delle Virgin Macerata also has a crocodile hanging, probable gift from Macerata returned from the Crusades. In ancient times they were seen with promiscuity figures of dragons, crocodiles or snakes and often, in the Christian era, were associated with evil, considered personifications of earthly hell, animals that lead to sin. 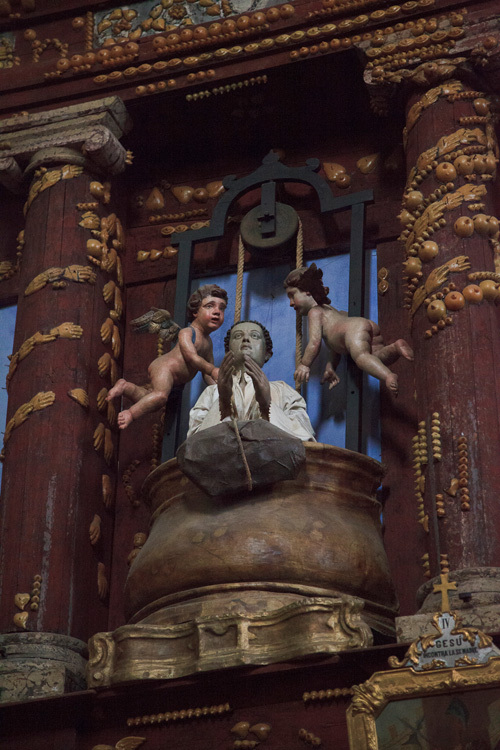 The placement of these animals in the churches thus has a strong symbolic meaning, as medieval churches also housed prehistoric fossils, therefore, the animal chained up in the vault of the church means to render it harmless, lock the evil he represents and at the same time expose a concrete reminder to the faithful against human susceptibility to error. Related to the crocodile "of Grace" and its derivation were born many legends and theories; there are those who believe he was an escapee from the zoo of an exotic private house of Gonzaga; others believe his acquisition was of a more miraculous nature: two boatmen brothers were resting on the bank of the river when all of a sudden one of them was attacked by a crocodile. The other, asking for God's guidance, armed himself with a knife and was able to kill the predator. 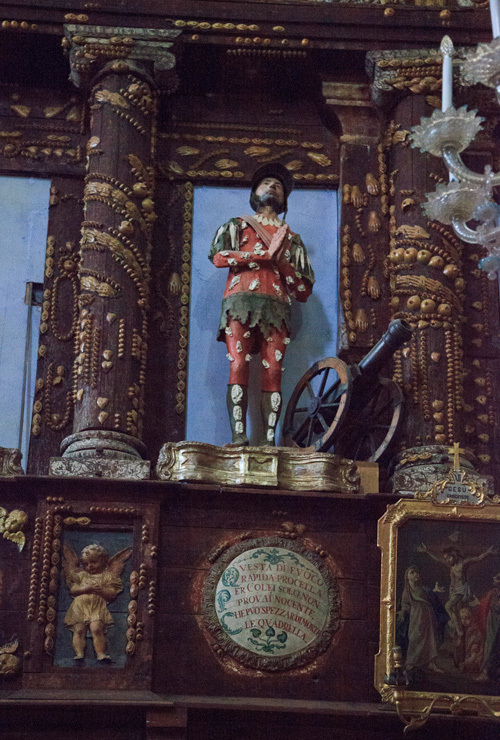 It seems that the church in the past was literally covered with all types of weapons, flags and banners from the ceiling and hung dried boats, as well obviously the statues and "panels" in wax reproducing parts of the body that are still present. Many of these objects are representative of an era, a way of life, habits of rural life of the place, and the social situation of the time. The ex votos depict hands and feet indicate miraculous healings likely to injuries while working in the fields (as also witnessed by the tools and the votive tablets found in other areas of the church), the eyes, the pestiferous boils of the plague, hearts, breasts to bring us to consider the importance of a mother to breastfeed at a time when there were no alternatives to maternal food. An interesting note is the presence of the ball that allowed the promotion to Series A of the football team of Mantua in 1961. That’s was a real miracle! 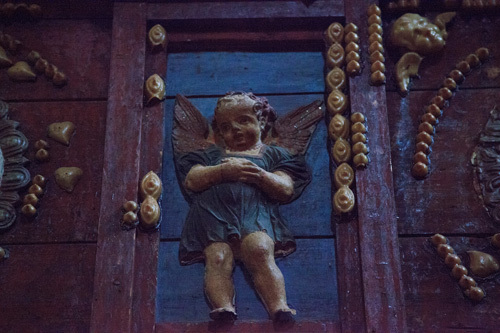 All images are my own, taken at the church. The text is, as indicated, written by the lovely Alessandro Molinengo.